An anechoic chamber is a special room that completely absorbs sound and electromagnetic waves. It’s an echoless room that’s designed to prevent the reflection of sound and/or electromagnetic waves. Furthermore, these rooms are also insulated from any external influences. Anechoic chambers are therefore said to be the quietest places on earth. How does it work? The basic principle behind making a room quiet to such high degrees is to ensure that there are almost no rebounding sound waves, meaning that all sounds are absorbed by the room itself. To achieve this, anechoic rooms are lined with wedges that cover the entire ceiling, floor and walls. This creates an uneven surface of a wedge network protruding from different directions. Rooms that are specifically designed to absorb electromagnetic waves (also known as ‘radio anechoic chambers’) are covered with different material (radiation-absorbent material) than regular anechoic chambers. These rooms consist of small pyramids that are formed by impregnating rubberised insulating foam with a conductible metal such as iron. Since 2016, the testing grounds in Hiroshima include a (radio) anechoic chamber. Why is this so important? With Wi-Fi, cellphones, GPS, digital radio, and television all competing for space, our airwaves are a constant buzz of broadcasts on an increasing number of frequencies and wavelengths. Modern cars are packed with electronic systems — typically up to 100 computers — that need to be protected from potential malfunctions. That’s where the anechoic chamber comes into play. Inside the huge space, insulated with carbon tubes and polystyrene, sealed off from the outside world, Mazda engineers bombard vehicles with radio waves — powered by a transmitter that’s more powerful than a national radio station. After testing, all Mazdas are guaranteed to be totally safe from harmful electromagnetic waves, anywhere in the world. 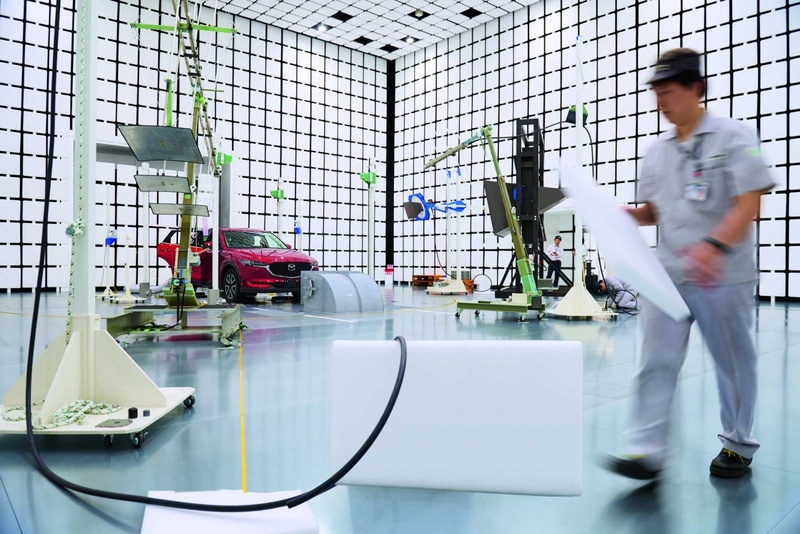 The first model that went through the testing at the anechoic chamber was the CX-5.